Instigating a national driver training programme, backed by Holden New Zealand, has put Greg Murphy in the winner’s seat with Kiwi motoring commentators. The motorsport icon today became the latest recipient of a prestigious prize presented by the New Zealand Motoring Writers Guild. The Neil Nelson award is presented to the person judged to have made a significant contribution to the motoring industry. This year the spotlight falls on Holden Street Smart, a road safety initiative designed with young drivers in mind, the goal being to reduce accidents and fatalities among this at-risk group. Operational since February on 2018, this national programme has already steered hundreds of youngsters toward safer driving practice. The initiative has a high-profile brand ambassador in Murphy, a four-time Bathurst winner and national motorsport hero. The Hawke’s Bay champion racer who made a career out of racing V8 supercars after winning the New Zealand Grand Prix and now mainly works as a motorsports’ commentator – though last year he tried rallying at national level – is a long-time passionate advocate for road safety. A road crash he had at age 19, during the first year of his circuit motor-racing career, was a huge wake-up call. It triggered realisation that, even though his own skills had been sharpened by competition experience in karts and a Formula Ford single seater, he was still deficient in basic abilities that would have avoided the smash, in which a friend was injured. 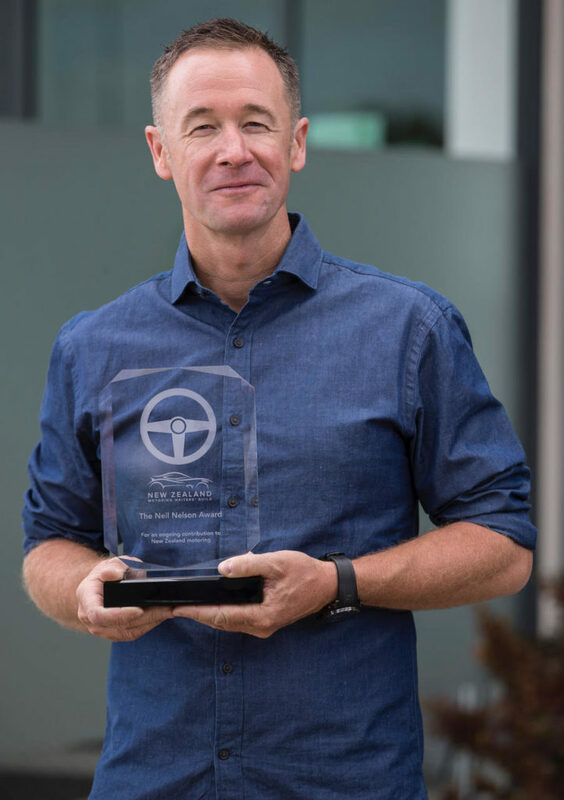 “The New Zealand Motoring Writers’ Guild is proud to name Greg as the 2018 recipient of this very special award,” says Guild president Richard Edwards, Auckland. “The Neil Nelson Award is not just about achievement. It’s about going that extra mile to help other people. “To be nominated it’s not enough to just do your job or your calling – it requires passion and commitment above and beyond. “Greg spent his life pursuing the motor sport dream; but almost right from the start of his illustrious career he has also been a road safety advocate. “Holden Street Smart, in which young drivers take part in a day-long course covering 10 practical exercises in their own cars, accompanied by a parent or caregiver, represents the ultimate expression of his views. “Our Guild is impressed by a programme is about experiencing a variety of scenarios and situations, exploring the limitations of themselves and their cars in a controlled environment, alongside experienced instructors. “We applaud Greg and Holden New Zealand for this programme.” Murphy says he is honoured to be a recipient of the Neil Nelson Award. “I am honoured, and pleasantly surprised – having Holden Street Smart recognised by the guild is fantastic. The story has been received and people are aware of what we are trying to achieve.” Murphy is passionate about the need for broader access to driver training. Holden New Zealand managing director Marc Ebolo welcomed the recognition of Holden Street Smart. “This award is testament that what we’re doing is being noticed and is making a tangible difference to the skill levels of those who participate in the course, enhancing not only their likelihood of knowing what to do in a particular situation but hopefully avoiding it altogether,” Ebolo says. The award, started in 1998, honours the memory of the late Neil Nelson of Palmerston North, a former president of the Guild. It was presented yesterday to Murphy and Marc Ebolo, managing director of Holden New Zealand. Previous recipients include ex Formula One driver Chris Amon and motor retail supremo Colin Giltrap. The first of the nine preceding winners was another race car driver who followed a similar path to Murphy’s. Christchurch’s John Osborne dedicated 22 years of his life to developing and running Proactive Drive, keeping teenage kids safe by giving them the skills they need to handle their car. 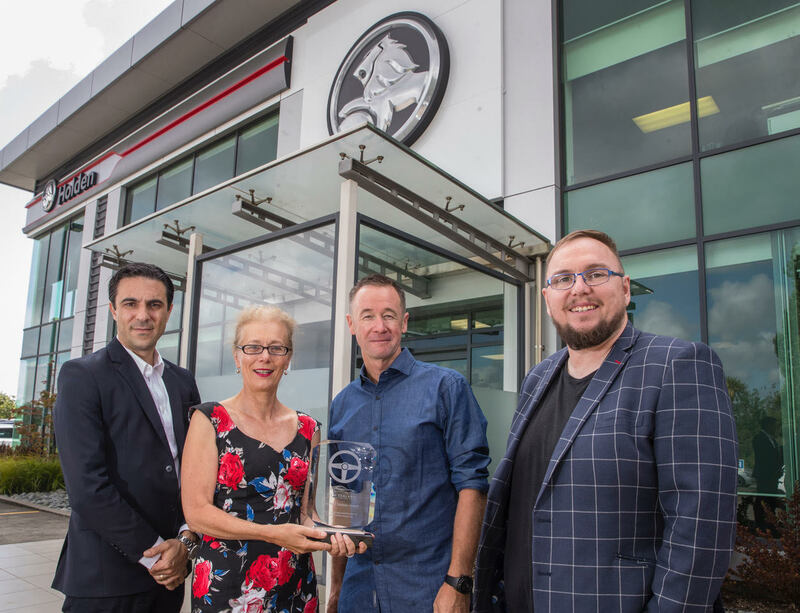 *Feature image: (from left) Holden New Zealand managing director Marc Ebolo, NZ Motoring Writers’ Guild member Jacqui Madelin, Greg Murphy and NZ Motoring Writers’ Guild president Richard Edwards.